Home » Blog » The HUB is open for business in 2018! The HUB is open for business in 2018! The 2018 Season of the HUB is up and running! The first day of “business” was May 2nd, and a grand opening party with music and burgers was held on Saturday, May 19th. The HUB is a free, convenient neighborhood bike repair spot for the residents of the Portsmouth neighborhood, specifically the New Columbia housing development. The neighborhood features many immigrant families, people living on low incomes, and children. The Community Cycling Center built the HUB in 2012, through lots of collaborations and partnership, including with the Oregon College of Art and Craft and Pacific Northwest College of Art, which helped design and build the structure itself. The next year, we worked with another set of partners to build an adjacent bike skills park. Ever since the fall of 2012, the Community Cycling Center has opened the HUB a couple days per week (May through September) to provide free bike repairs as well as training in bike maintenance & mechanics for all who are interested to learn. For youth or adults able attend, learn and help regularly, we also offer an “earn a bike” program, where 20 hours of engagement can earn participants a bike to keep. You can find us there providing repairs on Wednesday and Saturday afternoons 3-6 and also doing bike mechanics instruction on Saturdays 11am-2pm. Our current HUB team includes Carl Wilson (see separate story!) and Travis Hackett as our mechanics, Natty Pillias and William Francis as our Safe Routes to School Coordinators and Ira Dixon as our program manager. We are anticipating adding a couple young adult interns to the lineup soon, through our partnership with the SummerWorks program. 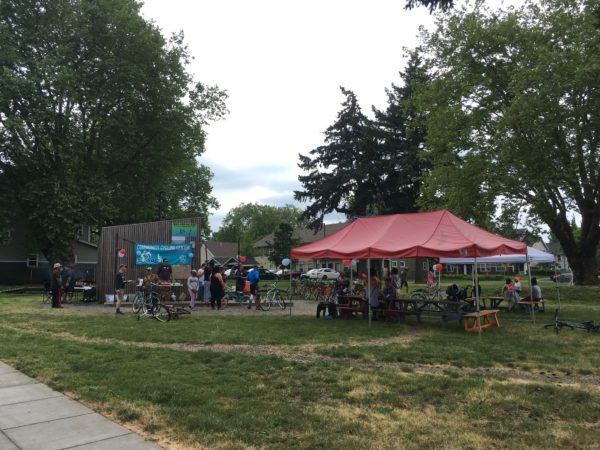 The North Portland Sunday Parkways on June 24th comes within half a block of the HUB, and we will be open for the occasion, so come on by and say hello! The HUB is near the corner of N. Trenton and N. Woolsey Avenues, across the street from Rosa Parks elementary school.